The Nikon Coolpix L18 is a compact entry level digital camera that combine performance with operating ease. It features 8.0 megapixels, a 3x Zoom-NIKKOR lens and sensitivity range up to ISO 1600, a large 3.0-inch LCD monitor offers a bright image that is a pleasure to view, even outdoors. The intuitive design assures a solid grip with a balance of flowing surfaces contrasted by sharp edge lines. MELVILLE, NY (Jan. 28, 2008) — Nikon is pleased to introduce the COOLPIX L18, a new addition to its Life Series line of digital cameras. Compact and easy-to-use, the L18 is the ideal camera for consumers looking to capture life’s memories at an affordable price. The L18 has 8 effective megapixels for generating superior quality prints, a 3x Zoom-NIKKOR lens for creative compositional freedom, an incredibly huge and bright 3.0-inch LCD screen for sharing images, and Anti-shake AE for images with outstanding clarity. Available nationwide starting in March, the COOLPIX L18 will be offered in Navy and Ruby Red. Adding to the L18’s ease-of-use, the camera is equipped with an Easy Auto Mode, allowing the user to enjoy carefree shooting without having to adjust any settings or controls. The L18 continues Nikon’s tradition of including its unique image innovations in its COOLPIX cameras. The L18 features enhanced Face-priority AF*, which automatically finds and focuses on a subject’s face in a frame; In-Camera Red-Eye Fix, which can automatically detect and correct red eye in a photo; and D-Lighting, which compensates for excessive backlight or insufficient flash in images. For composing and displaying images, the L18 is equipped with a huge, bright 3.0-inch LCD screen. When viewing images, the L18 features a special playback option, which magnifies a subject’s face to ensure that each image is scrapbook worthy. The L18 is equipped with a 3x Zoom-NIKKOR lens for creative control and freedom in a variety of settings, from intimate personal portraits to wide landscapes. Even close-up photography as close as 5.9 inches is as easy as point and shoot. To ensure steady shots, the L18 has an innovative Anti-shake AE feature that minimizes blurry images by automatically adjusting shutter speeds and ISO settings. For superior low light performance, the L18 has ISO capabilities up to 1600. In addition, the COOLPIX L18 offers TV-quality movie recording with sound ideal for being played on televisions and computers. The L18 is compatible with AA-size batteries in alkaline, lithium, oxy-nickel and rechargeable forms for ultra-portability. The camera also has 32 MB of internal memory and is compatible with SD and SDHC memory cards. The COOLPIX L18 even simplifies printing with PictBridge and is USB compatible for transferring pictures to computers and other peripherals. Additionally, the camera includes a complimentary copy of COOLPIX Software Suite for importing, editing and organizing images. 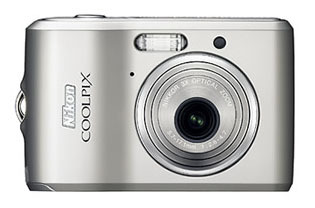 The COOLPIX L18 will be available in stores March 2008 with an MSRP of $139.95**. For more information about the L18 and the full line of COOLPIX cameras, please visit www.nikonusa.com.